(NaturalNews) Widespread consumer demand for plastic products that are free of the hormone-disrupting chemical bisphenol-A (BPA) has led to some significant positive changes in the way that food, beverage and water containers are manufactured. But a new study out of Germany has found that thousands of other potentially harmful chemicals are still leeching from plastic products into food and beverages, including an endocrine-disrupting chemical (EDC) known as di(2-ethylhexyl) fumarate, or DEHF, that is completely unregulated. But of major concern, and the apparent underpinning of the study's findings, was DEHF, a plasticizer chemical that is used to make plastic bottles more flexible. According to reports, DEHF was clearly identified in the tested water as the most consistent and obvious culprit causing anti-estrogenic activity. Despite trace amounts of more than 24,000 other potentially damaging chemicals, DEHF stood out as the only possible EDC capable of inducing this particular observed activity, a highly concerning observation. 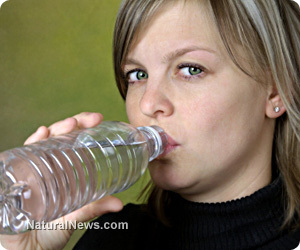 The study's published abstract explains that 13 of the 18 bottled water products tested exhibited "significant" anti-estrogenic activity, while 16 of the 18 samples were found to inhibit the body's androgen receptors by an astounding 90 percent. Additionally, the other 24,520 chemical traces besides DEHF were also identified as exhibiting antagonistic activity, which means that they, too, are detrimental to the body's hormonal system. But DEHF is apparently not alone in causing significant damage to the endocrine system, as the team was unable to identify this chemical as being specifically anti-androgenic. What this suggests is that there is some other chemical, or chemical combination, being leeched into bottled water that is interfering with the body's chemical signaling system, which is, of course, responsible for hormone production and use within the body. "We confirmed the identity and biological activity of DEHF and additional isomers of dioctyl fumarate and maleate using authentic standards," report the researchers. "Since DEHF is anti-estrogenic but not anti-androgenic we conclude that additional, yet unidentified EDCs must contribute to the antagonistic effect of bottled water." "This work is a 'tour de force' in identification of endocrine disruptors in packaged materials," says Bruce Blumberg from the University of California, Irvine, as quoted by Chemistry World. This type of analysis, he adds, "will be very important for our future understanding of what chemicals we are routinely exposed to and which of these pose hazards of being endocrine disruptors."